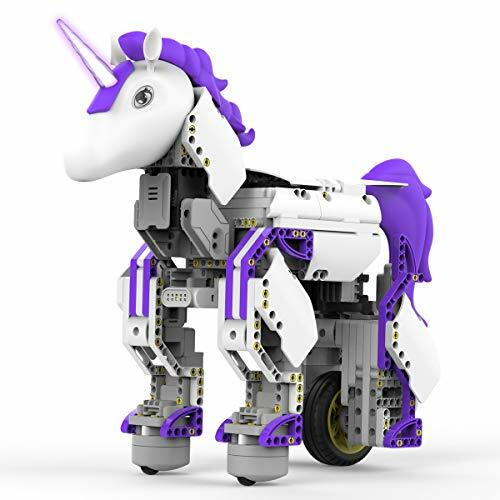 UBTECH JRA0201 JIMU Robot Mythical Series: Unicornbot Kit-App-Enabled Building & Coding Stem Learning Kit, 440Piece, Purple - UBTECH Robotics Corp. Create your own brilliant unicornbot, Thanks to the magic of Jim robot! This enchanted unicorn kit has everything needed to create a buildable, codable robot or invent your own. Download the free Jim app that has step-by-step, 3D, 360° instructions. The fun is extended with The blocks coding platform, allowing kids to build and code This legendary creature. Unicorns are Real -- build, code and share one today!